Today I decided I had to keep costs down somehow if I wanted to have money left to enjoy the last part of the trip, so before setting off in the morning I went back into the campsite kitchen to make the best use of the wifi connection I had paid and sent some CouchSurf requests for the next three cities, hoping I would get lucky despite sending them so late. My tent and riding gear had dried overnight, I packed them and spent some time rearranging all the bags on the bike. Ever since Volgograd I had been carrying the old front tire as it provided a useful space to keep the food bags and the bike cover, and support for the big Ortlieb bag with most of my stuff, but it also took up all the space in the rack and the passenger seat, so I got rid of it and now had to find a way to relocate the luggage so that there was space for my girlfriend, and I wanted to experiment with different weight distributions before picking her up. Today I put the bike cover under the Ortlieb bag to prevent it from tearing on the screws of the rack I had built to carry the spare tires and I strapped the food bags on top of each pannier. There was enough space in the passenger seat, plus the food bags seemed to make nice armrests. There was however a problem with that set up, which I discovered a few hours later. The sky was clear and the sun was out, there was no sign of the rain that had made my previous day so miserable. I put some good music on and got on the road to have on of the best riding days so far in the trip. 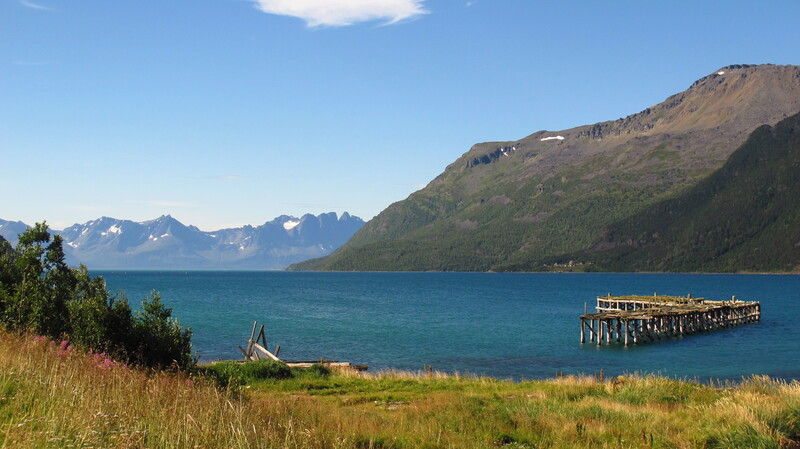 The landscape changed from the rocky, wind swept low fjords in the Norkapp to higher ones covered in forest at the bottom and with glaciers on the top. It was an amazing sight, and I thought that it was worth riding the coast for a couple days more despite the prices. It was like being in the Alps, only that the valleys were flooded in seawater, the surface completely still, reflecting the mountains and the fishing boats like a mirror. I stopped a couple of times, one for petrol, one for lunch, and met Italian bikers in both stops, a couple riding a Triumph who did not speak any English and then two friends who provided the perfect comparison of the two bikes I might consider as a replacement for my poor V-Strom – one of them was on a GS Adventure, the other on a KTM 990 Adventure. I chatted to the KTM rider, who spoke good English, and told me that the GS was great for long distance riding, it was very comfortable and had excellent range, but was no good on anything other than good dirt roads. The KTM on the other hand had much less range, about 250km only, but was great fun on the road and could cope with anything off it. And it was much cheaper too. After lunch I noticed that my chain was making a strange noise when I pulled out in first gear, and it was getting slowly worse. I thought that I might have tightened it a bit too much the last time I serviced it a couple of days ago, so I decided to find a spot to check it. I stopped at nice picnic area – there are lots in Norway – and put the bike on the center stand. Or tried to. It was usually difficult with all the luggage on, but now that I had put the weight a bit further to the back to make room in the passenger it was just impossible. I had to take the food bags and the tools off before I managed to get the bike on it. I checked the chain, and it was indeed too tight. Since I was at it and it had rained the previous day, I also cleaned it. When I got back on the road the noise had disappeared. 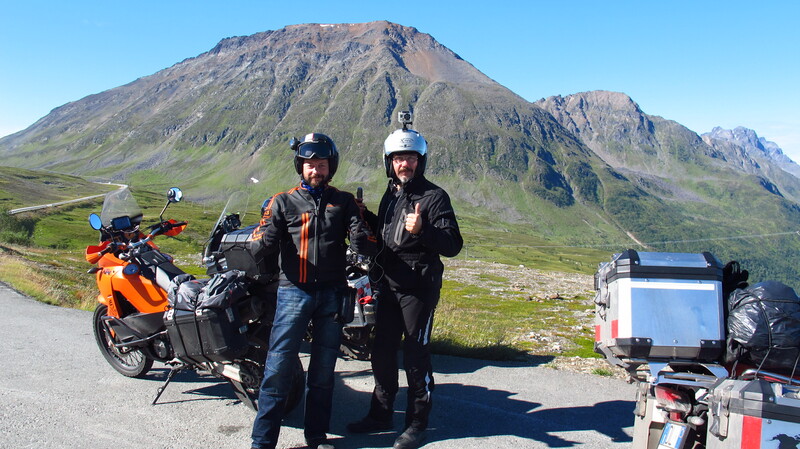 I had checked my phone when I stopped and I had got a reply from a host in Narvik, where I was headed for that night, which was great, I did not think I was going to find a place so late and was already thinking about finding a place to set up camp. 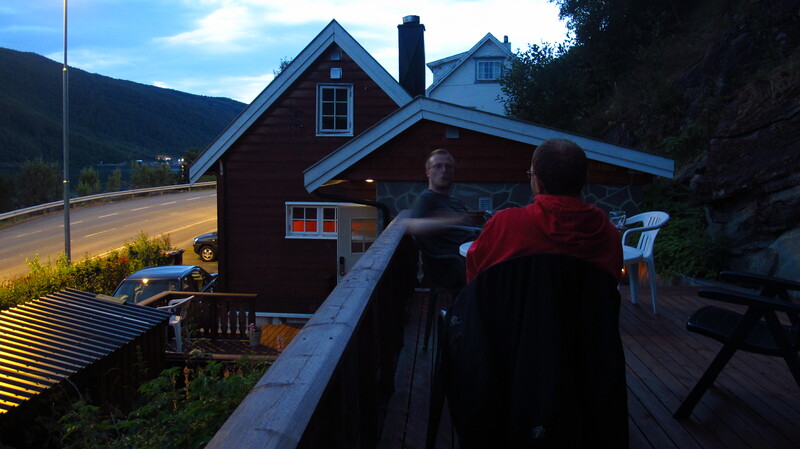 I got to Narvik past seven in the evening and found the address, it was a beautiful small house overlooking the fjord. Alf Tonny, my host, was waiting for me outside, I pulled up the driveway, got my things off the bike and after a quick shower I was sitting with him on the terrace having tea, chatting and enjoying the views. Shortly after, a friend of his dropped by to bring him a new table for the living room, and he joined us. He was quite interested in history too, and we talked about some of the highlights of my trip. Before he went back home I gave him the blog’s address and invited him to visit me in Barcelona. Then we went back inside and another friend of Alf came by with a bottle of wine, and I decided to call it a day on the blog and just relax for a while. 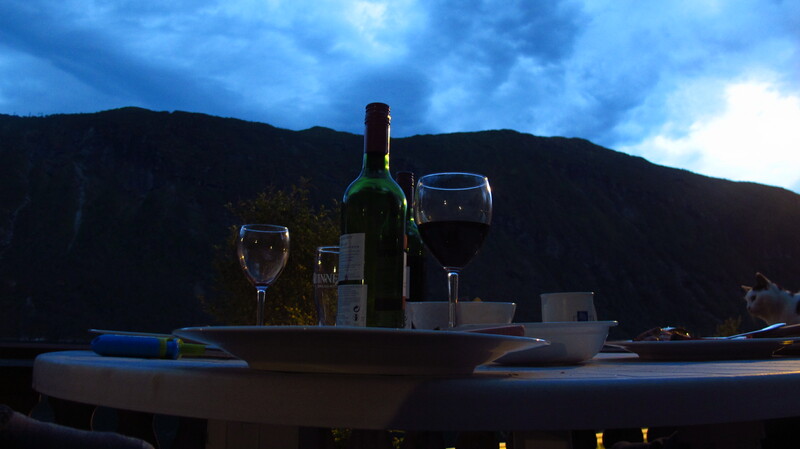 This entry was posted in Stroming The World 2013, Travel and tagged fjord, Narvik by Kilian. Bookmark the permalink.